Located in southwestern Romania Mehedinţi County is separated from Serbia and Bulgaria by Danube River. Danube neighborhood, the mountainous area of western and northwestern county, make it exceptional for holidays. Danube Gorge called Cazanele Dunării are extremely spectacular, unique in Romania. The area is located in Iron Gates Natural Park. The gorge formed by the Danube crossing the Carpathians has a length of 9 km between the massive walls of mountains Ciucarul Mare and Ciucarul Mic . The Iron Gates Natural Park is with its greatest part situated in this county. 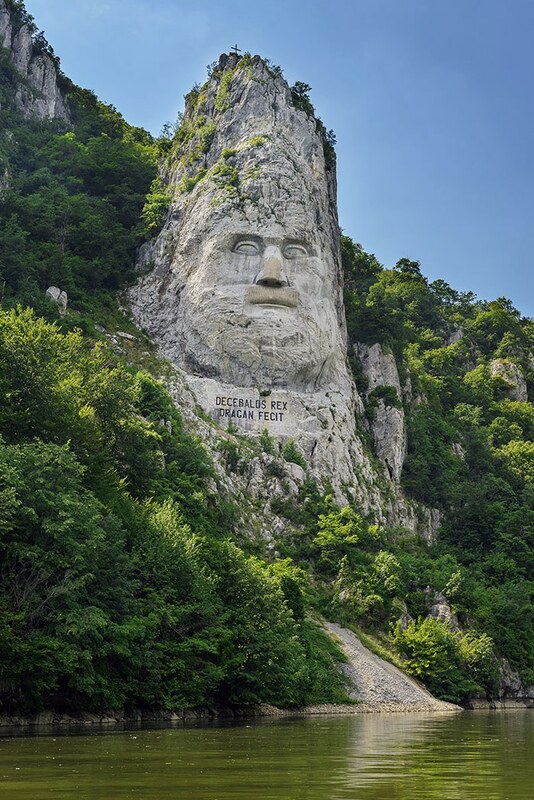 It is located in an area known as the Clisura Dunării. Besides flora and fauna and the Iron Gate water storage, in the area there are also cultural and historical invaluable sites like Ladislau Fortress, Mraconia Monastery and the carving with Decebal face. Inside the park there are 15 tourist approved routes, in which you can admire Danube Gorge, the Iron Gate water storage and beautiful flora of the area. Mehedinţi Mountains, part of Retezat- Godeanu Mountains in group, are placed in the southwestern part of the Carpathians. Mehedinti Mountains have a structure predominantly limestone, karst forms being very well represented. Maximum altitude is reached at 1466 m on Stan’s Peak. The easiest trails from Mehedinti Mountains are accessible from Herculane or Cerna Valley. There are several routes frequently visited by tourists such as Herculane – Crucea Albă (White Cross) – Domogled Peak or Țăsnei Gorge, but generally these mountains are wilder and are less frequented. Particularly spectacular is the area called “Crovurile” that has a unique and picturesque landscape. It is accessible from the road connecting Herculane with Baia de Arama, through Tâmna Gorge. Also from this road is accessible the trail that climbs to Stan’s Peak which on sunny days offers an exceptional panoramic view over the entire region from the Danube to the mountains Cerna and Retezat- Godeanu. Domogled – Cerna Valley National Park – lies on 8220 hectares and comprises the nature reserves in Stan’s Peak and Țesnei Valley. The park houses an exceptional floristic diversity on its territory, there are plants under strict protection, and their destruction is punishable by law. Another feature of this park is the great biodiversity of species of butterflies. More than 1500 butterflies species representing 45% of Romania’s fauna are concentrated here. The natural bridge formed after the fall of a Ponoarele cave wall, nearby. This karst phenomenon is very rare and spectacular. The bridge and the cave are situated in Ponoarele village. Topolniţa gorge -crosses on a distance of 20 km the Mehedinti Plateau, offering a beautiful scenery. In the area there is also the center of Ethnography, folklore and folk art Podeni. Orşova city – has a very spectacular position on the Danube, surrounded by hills. The Monastery St. Anne and Ion Dragalina Park are two sights that must be visited if you arrive here. In your way to Drobeta Turnu Severin, you can stop to visit the Monastery Vodiţa. Bala resort – is a health spa with sulphurous waters where they can treat a wide range of diseases. Drobeta Turnu Severin is the capital of Mehedinti County dating back to the Roman rule in Dacia. The Roman Camp, Trajan’s Bridge (made by the plans of Apollodorus of Damascus), Drobeta’s Thermae, and a Roman amphitheater, discovered in 2010 serve as evidence of the civilization of that time. In the city there are other tourist attractions: Iron Gates Region Museum, Water Castle, the ruins of a medieval fortress Severin located in Dragalina Park. The Cultural Palace “Theodor Costescu”, one of the emblematic buildings of the city houses a library, a university and a cinema. Danube presence gives to this city a special atmosphere.